Learn how the right lighting can help you create the perfect summer house with 4 key tips from our team of Calgary electricians. In the past, we’ve covered how to add the right lighting to your garden for maximum effect during the summer months. This year, we’re explaining how to create lighting for the ideal summer house. In this context, a "summer house" is the name for the trendy spaces many are opting to add to their gardens: think of it as a gazebo, or a shed renovated with comfort in mind. Summer houses are as unique as living rooms: they depend entirely on your sense of style and your interests. Some people imagine their summer house as a place to unplug from their busy lives, while others create a comfortable home office setup. Others wish to create a place for children, entertaining their guests, or relaxing with their family. If your summer house will be a place for children to read and play, consider ambient lights such as a ceiling light or pendant lamp. If your summer house is to be a cozy retreat, opt for warm-toned ambient lighting, and focus less on adding task lights. If you’ll be treating your summer house as a reading nook or somewhere to catch up on work, ensure that any reading corners are adequately lit. Multiple lamps or lighting on a dimmer switch can enable you to tailor the lighting to your needs. Some individuals are able to meet the needs of their summer house with battery- and solar-powered lamps, or with extension cords. This can certainly be a convenient and quick way to set up your backyard oasis: no setup time required! However, this method might not work for everyone. a summer home with a computer, a TV, or a mini fridge might require an entire octopus of extension cords, or go through batteries very quickly. extension cords threated across your yard could become susceptible to water damage. extensions cords can become a tripping hazard for children and can contribute to clutter in your yard or summer house. 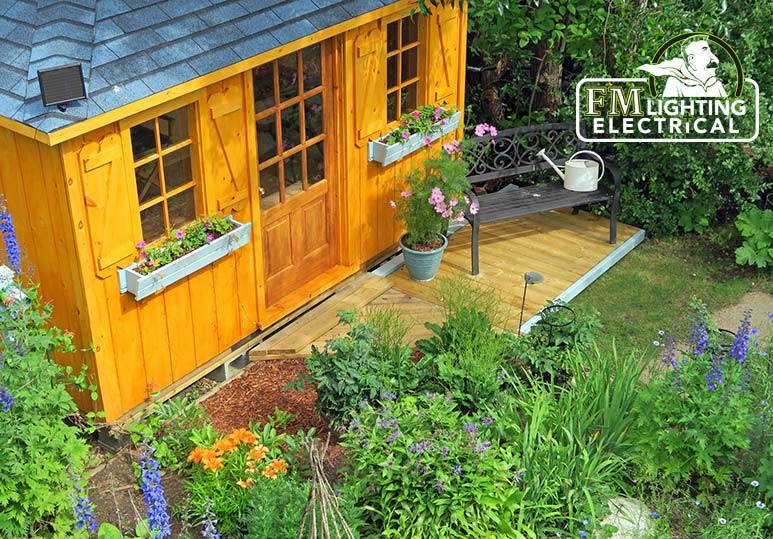 If you imagine yourself relaxing in and enjoying your summer house for years to come, consider scheduling a consultation with an electrician to learn whether adding electrical wiring to your summer house would be a good option for you. With the right LED bulbs and modern appliances your summer house can be incredibly energy-efficient. Once you’ve got the functional aspects of lighting your lighting down, it’s time for the fun part. Our Calgary lighting experts are skilled in lighting design in addition to electrical work. We can help you select fixtures and bulbs that complement your decor and offer energy efficiency. When it comes to creating the perfect summer house, the decorating may be fun, but let’s face it, you want to be relaxing in your summer house as soon as possible. Skip the planning and the hassle of trying to do DIY it: Call FM Electric’s Master Electricians. We serve homes and businesses in the Calgary area, and you can reach us at (403) 863-8529 or through our online contact form.